Who could believe that it is nearly the end of 2007. For the Parfitts it has been a very busy 8 months since we arrived home. So what has it been like? We had been pre-warned by other travellers who arrived home before us, what we should expect. While we braced ourselves for settling in troubles we are pleased to say it all went smoothly. It was actually nice to get back to school and to see everybody again. Both my school and Chris's made us feel very welcome and appeared to miss us. Alex slipped back into school really well and being in year 4 instead of 5 has caused no problems. At first he hung around with his mates in year 5 but now doesn't see them as much and has made some really good friends in year 4. How adaptable are kids. He loves his teacher and is going great guns. All reports are that a year on the road did him no harm. Surprise, surprise. Harry has taken to 'prep' like a duck to water and has won the heart of his teacher. He just manages to smile at the right time and do all the right things. Miss Cath is putty in his hands!! They are so happy, which has helped to make the transition back into normality (if that is what this life is) so much easier. So what are our future plans I hear you ask? Well we are on track to depart again in 2008, only this time it will be for 3 years. Yes, that is a long time, but there is a lot to see and do out there. Chris has had her leave for 7 years approved, only having to give 2 terms notice to return early. I applied for 3 years without pay which I thought they would laugh at, but bugger me they actually approved it. It is great not having to resign as I can leave my superannuation as is, will not lose 900 hrs sick leave, income protection insurance, life insurance and much more. To say we are happy with that outcome is an understatement. So far this year we have been a little anti-social as we have been working flat out getting ready for our next departure. As soon as we got home we unpacked all the crates and boxes from the shed, went through them all, culled and then repacked them straight into the shed. We are living the minimalistic life. Have to love it. I then spent a number of weekends and numerous trips to the wreckers getting the trusty old falcon roadworthy and ready to sell. I hate working on cars, hate grease and hate ripping skin off my hands which I did on numerous occasions. Anway just prior to needing skin grafts on both hands it passed the roadworthy, was advertised on E-Bay and sold in about a week to a guy from NSW. Couldn't believe it. Chris was against the sale so early in the year as she was convinced we needed 2 cars, I on the other hand was sure we didn't. I now ride my trusty old bike to school and love it. Being a one car family does require a little more organising but has worked out fine. 'Even she who must be obeyed' has admitted that having one car is all good. I must say that when September arrived and I was again attacked by magpies, I too started to doubt if being a one car family was such a great idea. Next was the garage sale. I hate to admit it, but they are fun, you do get rid of a lot of crap and you do make pretty good money. What didn't sell got donated. That was another big job out of the way. It was then back to working on the house in Buss St. There were a number of things that we wanted to do to it to make it a little more rentable. 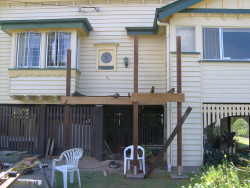 The first and most major of the improvements was for me to build a small deck at the front of the house complete with a new set of timber stairs ( the old ones had a bad case of dry rot) and moving the front door. What that achieved other than looking great from the street, was to officially make it a 3 bedroom house with sleepout as opposed to a 2 bedroom. That equates to a house easier to rent and for more money (we hope). Moving the door has also made the lounge/dining area much lighter and improved the airflow. It should make a big difference come summer. As with every job I do it took 5 times longer than I expected. Now it is onto painting a couple of rooms inside the house and touching up the skirting boards. We did have grand plans for the kitchen (let's not mention the huge deck out the back, breakfast bar, landscaping, painting .....the list WAS extensive - Ed) but I have already admitted defeat, as we are running out of time. Some new carpet on the new bedroom floor and the masterpiece will be complete, at least for this year. In typical Parfitt fashion when we are working flat out to leave again, it is important to throw in a few extra jobs to try and really push the boundaries. For some insane reason I decided to do some more study, this time in 'Sexual and Reproductive Health'. I have just finished the course and am really questioning my timing. 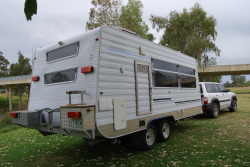 Then just to prove to all and sundry that I really am crazy, I towed the caravan back down to Eden in NSW (on my own) to totally revamp the exterior. 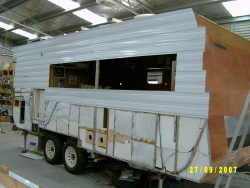 You may remember that in November 2006 on our way home we rebuilt the chassis and drawbar. Well back to the same place. Bryan again very kindly offered me the use of his workshop and his expertise and we totally resheeted the exterior of the van, all new windows, a new front boot, fold down table, external speakers, external shower, new kitchen window, new lights, new insulation and the list goes on. It took a little longer than I expected (taking just on 3 weeks) but looks absolutely outstanding. Once again I could not have done it without the help of Bryan and one of his employees, Dale who came in early and stayed late helping me out. Thanks just doesn't seem enough. Chris and the boys flew down to Canberra and I went up to collect them. 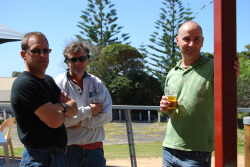 While I worked on the van they enjoyed the beauty that is Merimbula. Wayne, Tracey and little Bailey who we met and traveled with for nearly 6 months last year made the trip across from Adelaide and also stayed at Bryan and Jane's for just on a week. Wayne also got involved in the van resurrection, coming in to help out for a few days, and his effort was very much appreciated. It was unfortunate that I was so busy and didn't get to spend as much time with them as I would have liked. We did have a day off and we went out whale watching. 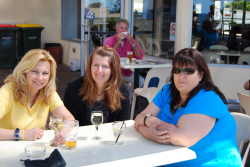 The trip that left from Merimbula was fantastic. Within 15 minutes of leaving the river mouth we were surrounded by at least 6-8 whales that seemed happy to play around and show off to us all for a couple of hours. All this and not another boat to be seen. Just us and the whales. What a great experience. I am not really sure who was watching who? When I finally finished the van we packed it up, said our goodbyes and made the mad dash home doing nearly 2,000 kms in 3 days. Was it worth it? Bloody oath. Other jobs that we have done this year include putting in a second battery in the car, a snorkel (for those deep Northern Territory water crossings) and purchasing an 85 litre Evacool 12 volt esky. 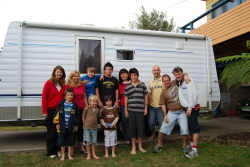 Why do we need an esky when we have a caravan?? Well. 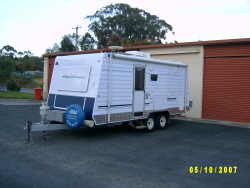 We have just picked up our new custom built 'Off Road' camper trailer. Laugh you may but there is method to our madness. Let me explain. So the search began for a good quality, second hand camper with 16" wheels, in brilliant condition and dirt cheap. Couldn't find one!! So plan 2. Order a new one that has everything on the wish list, one that can handle the Gibb River, Tanami, Strezlecki and Old Telegraph Rd to Cape York. 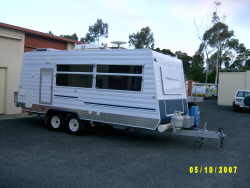 We are talking a camper trailer on steroids. A beast. This thing is 7'x4', has a 100x50x4mm chassis and drawbar, 45mm solid square axle with parallel bearings, Cruisemaster 1300kg springs, Nissan Patrol 16" wheels with off-road electric brakes. Add a 2.1 metre long drawbar, hyland hitch, 2 huge toolboxes, bike racks, stone guards and the ability to carry over 200 litres of water, 2 x 12 volt 110 amp deep cycle gel batteries and we are off!! Should do most of the stuff we want to do. Bring on those dirt roads!! After doing the rounds of every camper trailer shop we could find, including the 'QLD Caravan and Camping Show' for 2 exhausting days, we ended up getting one custom built in Bundaberg. This small family business 'The Trailer Shop' could not have been more helpful. Regardless of how many times I changed my mind or no matter how many stupid ideas I came up with they smiled and said that will be no trouble. I am sure Errol was mumbling other things under his breath!! 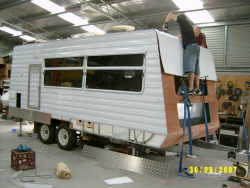 The quality and workmanship of this trailer is the best I have seen and I am 100% happy with the end result. For those of you who know how fussy I am, you might find that hard to believe but true it is. If you are in need of a trailer, camper, horse float, builders trailer, parts or repairs give these guys a call. You will not be sorry. So back to the beginning. Why have we plucked the 3 years traveling thing out of thin air?? Well 3 years is the time we have left before Alex starts high school. So you can see it's now or never because then we will have Harry to deal with. So 2008 will be the beginning of part 2 of our adventure. The web page will be back, although possibly with not as much to report each month as last year. We are not exactly sure what we will be doing, but be assured whatever it is it will be different and exciting. Every so often we have the odd 'Are we doing the right thing?' thoughts. 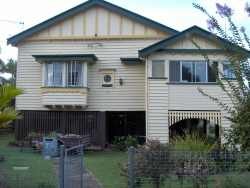 They mainly revolve around the kids with schooling and sport. At the end of the day, it is only for 3 years, and yes, they will miss out on some things, but just imagine the things they will see and do, and the memories that will last a lifetime. Is that more important than a few tennis or soccer lessons? Alex for one seems to think so. 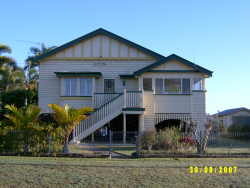 We do plan to return each Christmas to Cotton Tree on the Sunshine Coast for our 3 week pilgrimage and then up to Bundaberg for a few weeks to see friends and do some house maintenance. After that, its up to the gods. Departure day is Friday 14th December and is fast approaching. 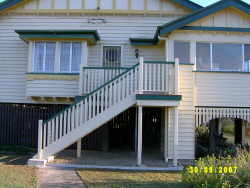 Buss St has already been rented with the tenants shifting in, in the first or second week in December. We still seem to have this endless list of jobs that need to be done, with it becoming very clear that most of them won't even be started let alone completed. Oh well! What is really important to us is that we are going to give this trip a go. Succeed or fail, love it or hate it we will have given it a bash and won't spend the next 12 years wishing we had gone. No regrets, no gunnas around here. Staye tuned for another update on our departure. The person that risks nothing, does nothing, has nothing and is nothing. He may avoid suffering and sorrow, but he simply cannot learn, feel, change, grow, love and live. To take risks is to truely live.